The group is created by Ashok Gupta for hosting the experiences of Mrs. Veena Gupta about the Leelas of Baba and HIS Photos and other material related to Shirdi Sai Baba. Group recitation of Sri Sai Amrit Vani is held every Thursday from 11 AM to 12:30 PM at Sidhartha Extension, New Delhi. Members are included in the recitation of this group recitation on Thursdays (in absencia also). The List of devotees who recited or read Sri Sai Amrit Vani at their place in absencia, any time, on Thursday is circulated in a weekly letter. There are 12,000+ members in the group and they recite Sri Sai Amrit Vani in Group and Baba’s presence is felt very strongly during pooja and prayer. For the new members of the group, I would like to inform that every week, on Thursday we do the group recitation of the Sri Sai Amrit Vani, Prayers to Baba, Noon Aartee and Parayan of a Chapter from Sai Satcharitra. In the recitation all the devotees sing along with the Cassette and with books in hand. We see the leelas of Baba and Devotees feel the presence of Baba in many ways. You can download the scripts of Sri Sai Amrit Vani in Devangiri (Hindi), English, Gujarati, Spanish, Telugu,and Tamil. Group Photo Section contains about 700+ photos related to Baba in many albums. Members are requested NOT TO PUT ANY MATERIAL, NOT RELATED TO SHIRDI SAI BABA. FOR VIDEO CLIPS and Bhajans in MP3, You may also VISIT YAHOO GROUPS mysaibaba21 and mysaibaba22. More Clips and Bhajans are in the file sections of the groups. You need to download both audio files. There is demand from the new members of the group to know in detail about the happenings in Sidhartha Extension, New Delhi, and how we do the Sai Amrit Vani and the Parayan of Sai Satcharitra. Today I will try to describe in detail but I am afraid that I may not be able to do full justice to it, as I am very poor in writing and some happenings and feelings can not be described, but only can be felt. Mrs. Veena Gupta is devotee of Sai Baba since 1978 or so, When she was working in the Meditation Centre of Maharishi Mahesh yogi in Golf Link. I joined her actively only after retirement from Govt. of India in 2003. I was working as Adviser, (Joint Secretary) and was able to attend the recitation of Sai Amrit Vani, only when there was no meetings or important work at that time. Group recitation of Sai Amrit Vani started around 1998, when Udi started oozing from the Photos. The frequency and the quantity of oozing of Udi increased gradually and now almost every day it is oozing. New devotees are welcomed only on Thursdays for the Sai Amrit Vani. We all devotees recite together along with the cassette played on the music system. Prayers for all and Parayan of Sai Satcharitra is done by Mrs Veena Gupta and all other listen to it and pray themselves also. Sri Sai Amrit Vani an interesting, spiritual, simple yet very powerful and meaningful literature in lyrics form and which we have adopted in our life. It has been composed by Sh. V K Bassi, who is managing the activities of Sri Ram Bhakt Society at Shivalik, Delhi, The material has mostly been taken from Sai Geeta, Sri Saicharitra and Sri Ram Amrit Vani. In the book form, it was first printed around 1997. It has been sung by Sh. Jagdish Kalra and recorded on a 60 minutes cassette and hence it is a complete one hour program in Hindi. The cassette is 30 minutes on each side. It has been converted to MP3 files from the Audio cassette into two files. These files are of 30 MB each are available in Hindi , English, Tamil and Telugu. The program has few parts. (i) Sai Amrit Vani (ii) Bhajans (iii) Pads (iv) Prayers (v) Vandna and the (vi) Aartee. There is no specific time to do Sri Sai Amrit Vani,. It can be done at any time of the day at any place, But one should be clean and place should also be clean. When it is done in the mandir before Baba then one should clean oneself and put some Bhog before Baba. We all recite Sri Sai Amrit Vani together along with the cassette. Few devotees are distributing these CDs, Cassettes and the books of Sri Sai Amrit Vani isfree of cost to needy devotees, who does not want to purchase them. There is no particular time to do it or to recite it, It can be recited on any day, But Thursday is a important day. And it is better if it is done in the group and we found 11AM to 12 PM is the best day time. Groups are formed at different places. Where ever the time difference is much, we advise them to follow the local timings, as we feel that Baba can even be present at different places at the same time, so there is no barrier of time and place for Baba. Where ever we have gone, we have recited it at 11 AM Local Time, We have followed local time even in Singapore, Malaysia, Atlanta, California, Toronto and so on. Every Thursday Recitation of Sri Sai Amrit Vani is held at Sidhartha Extension, New Delhi, but we have slightly changed the order. Instead of the general Aartee in between, we do the full Noon (Madhyan) Aartee, the same as being done in Shirdi after the Sri Sai Amrit Vani. It is followed by group prayer and a chapter from Sai Satcharitra is read by Mrs Gupta. It starts exactly at 11:05 AM and goes upto 12:00 Noon (Madhyan) Aartee is performed exactly at 12:00 and reading from Sai Satcharitra after the Aartee. It goes upto 12:30 or so. 3 metres cloth in length and 46" in breadth. 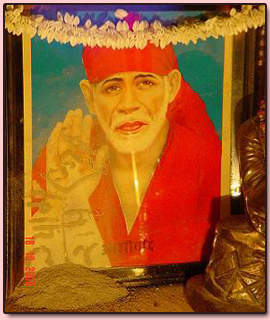 Note: This site is built to help followers of Shirdi Saibaba and spread his teachings. If there is any break of copyright law then please contact on this email mymitr@gmail.com to remove that data.